Just as there are no guarantees in life, so too are there no guarantees in gaming---gambling---be it in a casino, on a cruise ship, on the internet, or at the Kitchen table. We all know there are video poker machines calibrated to return paybacks of 100 percent-plus. 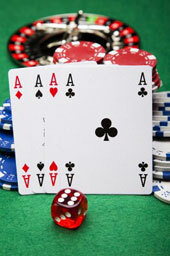 What many players don't know is that the manufacturer also informs the buyer of the machines. Yes, the machine will indeed payback 100% plus, providing "it is played at maximum skill………." So it is with the gaming aids we advertise for sale; they come without guarantees. steven or ahead of the game. Remember Luck has a short shelf life .. Knowledge lasts forever … those last four letters, "Edge," that's the ticket, the bottom line …..